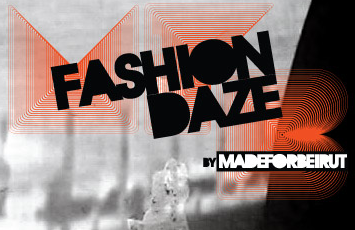 Fashion Daze Beirut – Positioning Beirut through fashion? From September 16 until September 19, local and international emerging Fashion designers and photographers join their talents to re-interpret Beirut in a raw forsaken urban space within Souks Beirut, that will be exclusively revealed for one weekend. Their work will be discovered through a series of mixed media installations unfolding into moments of Beirut. Fashion Daze changes the face of Beirut for a whole 4 days through fashion; exposing Beirut’s vernacular and glamorous culture to the world. What is Made for Beirut ? MFB is a fashion movement that situates fashion in a schizophrenic city that is in constant (re)construction. “We stitch vernacular with glam; we sew; we emphasize authenticity.” MFB is a collaboration amongst people who love Beirut. It is a call for action. It is the platform that will allow change to happen. For more information you can check out the Event on Facebook or follow the Fashion Daze Beirut blog. This entry was posted in Lifestyle, Only in Leb and tagged aishti, beirut, Fashion Daze, raya tueny, solidere, souk beirut. Bookmark the permalink.